Most of this post was written while sitting at the end of my nana's bed, watching her struggle to let go of life. This morning she won that battle and let go. And I am bereft. On Sunday night my mum rang to say nana wasn't well. Nana has had turns in the past but this seemed more serious. My cousin rang on Monday to say she had gone downhill overnight. After a family conference, Rebekah decided to skip Tuesday's exams and we left to see her. We went straight to the home. Nana was sedated and unaware that we were there. She was restless, often calling out. It was hard to see her like that. I would have preferred to see her at peace, at ease and ready to go. We held her hands, we stroked her hair (which she always loved), we prayed with her. And I cried. My earliest memory of my nana is actually of my mum doing a frantic 'stash and dash' because nana was coming to visit. My nana always maintained an immaculate house. There was a routine and order to all her days. Breakfast was eaten, dishes were washed, beds were made. She got dressed up to go to town, even if it was just to the butchers. But she never trained her children how to do housework, or to cook. My great-grandmother died when nana was two, shortly after giving birth to Aunty Ethel. Ethel was a war bride, leaving Australia in the late 40s and only returning once in the 50s. Ethel was nana's closest sister, they wrote often and shared their lives long distance. My dream was to connect them through the magic of Skype, but it never happened. My great-grand-dad remarried the story-tale wicked stepmother. She worked the children hard and nana always bore the emotional scars of her childhood. I think one reaction to that was to try and 'protect' her children from chores. My next conscious memory of nana was after we were evacuated from Darwin following Cyclone Tracy. It's only a very vague memory of being met at the airport. I have much clearer memories of the long trestle tables of clothes and toys; and the injection at the end :-( I have no memories of our stay with nan and pop or returning to Darwin. I do remember flying back south, by myself, squeezed in between a bunch of businessmen, who all shared their fruit cakes with me. When I arrived nana filled a plastic container with my fruitcake collection. I left Darwin in February and stayed with nan and pop until September. I have a smattering of memories from that time. 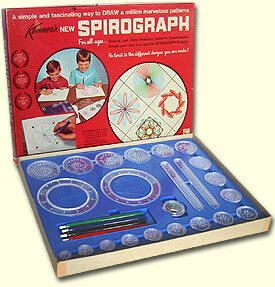 Getting into trouble for leaving the pins of my Spirograph on the path to the clothesline. It's the only time I can recall nana smacking me, and I was SHOCKED! I remember sleep overs with my cousin, walking to school, hot chips for lunch. Imagine - they let little Grade 2s leave the school, and cross the road to the fish and chip shop to buy our lunch. Unaccompanied! Twenty cents for a big wrapped package of hot chips. I remember Lifesavers from the rack at pop's garage. Going for joy rides with Lenny, who had a red sports convertible. I presume he was an old of mum's, but I really don't know. Little Alfie, with his terry towelling hat, who worked in the garage with pop. Eating iceburg lettuce, sprinkled with sugar. Being scared of my Uncle Brian, because he was so big and loud. He's still big and loud, but not so scary. Listening to the waves at night if there was a storm. Bathing in the concrete laundry tub. Nana brushing my long hair every morning, while I perched on a stool. I'm pretty sure that stool is still in my Uncle's laundry; I spied it just the other day. And being sick. The idea of staying with nan and pop was that I would be able to go to school. With the cyclone and housing shortage, mum and dad were living on the other side of the harbour to the city. Getting to school meant a 20 minute ride in the dingy. However, I was so sick while staying with nan and pop I'm not sure it made too much difference. I caught every cold going, developed bronchitis. I remember revolting powder that got puffed into the back of your throat. Blurgh. In September, when mum and dad finally moved back to town, nan and pop drove me home. I don't remember much of the drive. Pop had an old Landrover. Whenever I see a Landie I think of my pop. It only had front seats. I can't remember if they were a bench seat or buckets, but my normal perch was a mattress on top of everything loaded into the back. I would lay down so I could see out the front. My pop taught me to whistle on that trip. I'm sure that drove nana round the bend! Summer at nana's meant cold meat and salad for lunch; meat and three veg for dinner; jelly and icecream for dessert. Every week nana would bake Anzacs and Cornflake biscuits. Pop had a big veggie patch; veggies always tasted better at nana and pop's. Nana pickled her beetroot and it was nothing like the stuff out of a tin. Pop also had chooks and ducks. Sunday roast had often come from the backyard. Nana had a beautiful flower garden. She would spend hours outside very day, weeding, planting, watering. 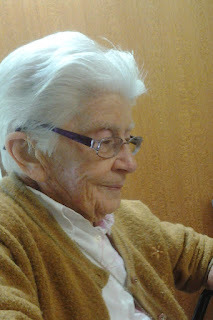 Even in the nursing home, up until a couple of years ago, she worked in the gardens (and harassed the poor gardener). When I was 18, nursing a broken heart and experiencing my first redundancy, I ran away to nan and pop's. The idea was to make a fresh start. After three months, I went home again. But I went home less broken and wounded. Nan and pop just accepted me; allowed me to mooch through summer watching cricket and seemingly doing very little except healing. When I joined Covenant Players, I would often spend my holidays with nan and pop. Again, I would seem to achieve very little during my stay. I do remember during one holidays being floored that nana was happy to let the breakfast dishes wait until lunch time. She had always been a stickler for doing dishes as soon as they were dirty. My uncle and aunt bought nan and pop's house. They've renovating and it looks lovely. But part of me, the part of me full of memories, cries out "What are you doing?" The kitchen was ugly (it was always ugly - orange counter tops, dark cupboards, strange greeny-browny lamenex something on the walls), it was falling apart - but, oh, the memories. Meals, and baking, and cups of tea and always, my nana in attendance. When I was planning our wedding the main priority for me was for nan and pop to attend. I really didn't care about all the other details. Aside from it being about 40°C in the shade, I would have been happy to get married in trackies and sneakers, if it meant nan and pop could be there. As it was, my mum ensured there were frills enough. In some ways, getting married in Woodburn complicated things. Daniel's mum got the place mixed up and ended up not coming; getting most people there was a nightmare; finding flowers and food was difficult. But nan and pop attended and I was happy. One of the joys of moving to Brisbane meant nana and pop were accessible. Although still three hours drive away we have been able to see nan several times a year. 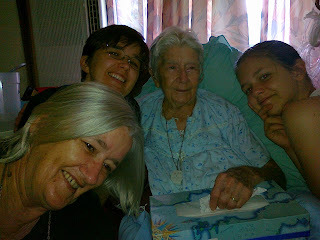 She told us stories - stories of her childhood; her granddad who was a Victorian police officer during the Ned Kelly era; her dad, who she clearly adored; her step-mum, less so; going to dances (she loved music and dancing); meeting my pop. Stories about my mum (what a rascal). I've enjoyed rebuilding a relationship with her over the past 10 years. Some years ago, she died during an operation and they were able to bring her back. But whatever extra time we've had, it has been too short. We have had scares like this before. But always she was up, dressed (coordinated and neat) and coherent. It's hard to see her like this. Weak and dependent. Death is not dignified. Even the nursing staff calling her "Dotty", which she would loath, seems less than dignified. However, it's obvious from the way they treat her that they see in her some of what I see in her. I watch them massage her hands, stroke her hair, kiss her forehead. And I'm glad that in these, her final days, she was surrounded by people who recognised she was special. This morning my darling nana won her battle to let go of life and I am bereft. Mum, me, Nana, my Girl.